Two of my HUNT family ancestors, Mary Margaret Hunt (1900-1979) the daughter of Edwin Herbert Hunt, and Betty d’Archy (1910-1997) the daughter of Edwin Herbert’s sister Lily (Hunt) d’Archy, both had copies of the beautiful family coat of arms shown below, hand-painted on parchment. (It will be referred to as the ‘Hunt COA’ from now on). The provenance of the artwork is unknown, but the shield is believed to have been copied from some embossed stationery about the time of Edwin Herbert Hunt. Possibly his son Herbert William Hunt (1913-1937), said to be an artist of exceptional talent, was responsible. Edwin Herbert’s granddaughter Eleanor (Hunt) Symons has given Mary’s copy to the author and the other is in the safekeeping of Kirkwood Johnston, great nephew of Betty d’Archy. Mary Margaret tried to find out more. She wrote to an Australian Heraldry authority in 1966, sending not the COA above but a sheet of cream stationery embossed in blue with the same crest (only) and motto. There is a photo of this crest lower down. 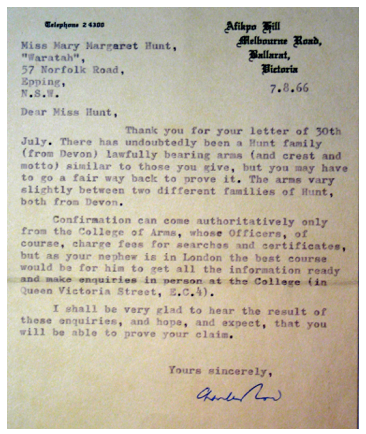 The nephew in London referred to in the letter Mary Margaret received in response was most likely Peter John Hunt (1929-2012), another grandson of Edwin Herbert Hunt. It is not known if he followed up on this request. It should be noted that the rules of Heraldry vary by country. In Great Britain nobody is entitled to a family coat of arms unless it has been specifically granted to a person and his/her heirs – ie if you can show direct descent to one of the bearers of a coat of arms then you can “inherit” these arms. But in America there is no legal requirement attached to coats of arms. There you may design and display anything you like, including the coat of arms of someone who bore your surname whether you are directly related to him or not. The SHIELD within the Hunt COA bears a very close resemblance to the shield of an Irish Hunt family. Using non-heraldic terms, both have three leopard faces on a diagonal gold stripe, and two golden harps on a blue background (first shield below). A different version of this shield also occurs in three ornate American-designed coats of arms. They all have six leopard faces and no harps, instead they have the familiar red lion which appears in the British coat of arms and is often used to signify royalty; it may have been added by the American designers to emphasise the British origin. Incidentally the term ʻcrestʼ on the third one is incorrect, the crest is the part of a coat of arms located above the shield. Our Hunt COA has a CREST depicting a hound (in heraldic terms a talbot serjeant) wearing a collar attached to a vertical halbert/battleaxe. It is almost identical to the Hunt family crest of Roland Hunt of Borealton, Shropshire, according to Fairbairnʼs Book of Crests 1905. Many other family crests also have a hound and halbert but with the halbert placed diagonally. Boreatton, the seat of Rowland Hunt, esq. 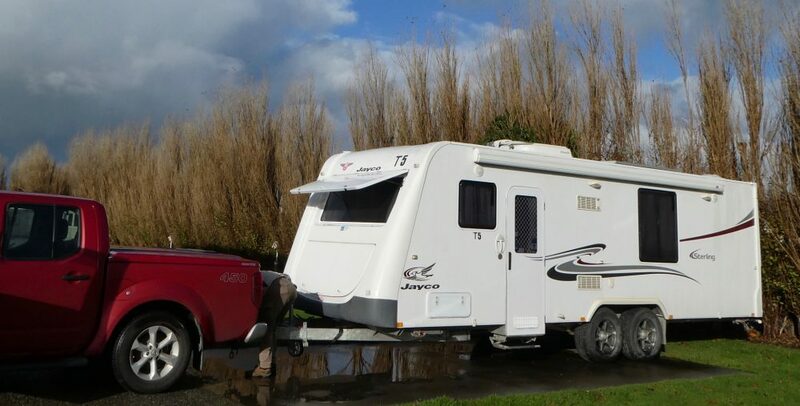 Was 8 miles south-west of Wem. (Source: The Shropshire Gazetteer, Printed and Published by T. Gregory, Wem, 1824.) Rowland Hunt was the Sheriff of Shropshire in1672 and died aged 72 at Boreatton. He had one daughter who married. (So, no male heirs to carry on the Hunt surname). According to Florence Helena “Poss” Peterson (1904-2001) the granddaughter of Mary Ann Hunt/Boshier/Harrang the sister of Edwin Hunt (father of Edwin Herbert), the family emblem (ie crest) was the Horn of Plenty (personal communication, Kay Balnaves). There is no Horn of Plenty in our Hunt COA but a bugle-horn does occur in about ten different published Hunt coats of arms. One such is in the Fairbairn book of 1905, the crest of Hunt of Ashover, Derbyshire. In 1220 a family named Le Hunt were owners of Overton Hall in Ashover, where they continued to reside until 1556, when Thos. Hunt sold the Hall and the estate to Richard Hodgkinson. This Thomas and his wife Alice moved to Aston On Trent, Derbyshire and are buried in the village church. The horn also occurs in various stylised (and heraldically incorrect) coats of arms offered by American websites. Yet others add a knight’s helmet to the crest, sometimes with a horn as well. The Hunt COA motto is Credentibus nil difficile which means “Nothing is difficult to believe” – a very apt motto in this case! It also occurs in one stylised American coat of arms (from an American website for heraldry clipart). Other so-called Hunt coats of arms have a different motto, notably Cor nobyle, Cor immobyle which means “A heart noble, a mind determined” according to one translation and “A noble heart, a heart immovable” according to another. Incidentally this particular motto was attributed to Hunt of Ashover by an American website specialising in buying and selling old silverware, but Fairbairn does not list such a motto. In an old book called Burke’s General Armory of England, Scotland, Ireland and Wales published 1884, Cor nobyle, cor immobyle is the motto for families named Symons, Vivian, Hussey and Hyett (no Hunt). The Credentibus motto isn’t listed in this book. Apparently mottoes were not generally displayed with coats of arms. To quote a British authority on a Heraldry discussion list: “Just because you see a coat of arms somewhere, it doesn’t mean that they have been recorded in a particular surname. And even if they are recorded somewhere, they normally pertain to the original armiger who was a person and not a family. On his death, the arms would be inherited by his legitimate offspring. 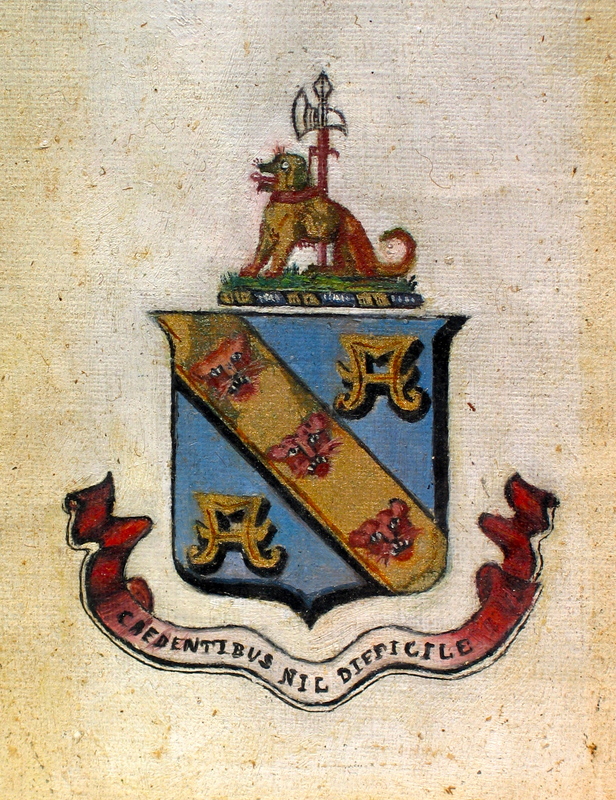 For you to be able to have any claim in those arms you would have to have a fully documented pedigree (including all the children of each generation) back to the original armiger.” See http://cheshire-heraldry.org.uk/right_to_arms.pdf for a more detailed description. Some of our immediate ancestors thought we were descended from Thomas Hunt the Mayor of Exeter, whose son Thomas in 1573 bought Hams Barton at Chudleigh in Devon, and died in 1548. The letter from the Heraldry authority supports this. But using the most modern (2014) internet searching I have been unable to find any links between the Hunts of Hams Barton with the Hunts of Redmarley or any other Hunt families in Worcestershire and surrounding Counties – and there were many. The conclusion has to be drawn that the lovely hand-painted COA at the beginning of this article was a figment of an ancestorʼs imagination. It was easy – and fashionable – to claim descendancy from a noble family in those times because it was very difficult to prove otherwise!